Continuing the work to build my propagation bench, I paid a visit to Oxford Wood Recycling which is a social enterprise I’ve used before when I’ve needed inexpensive timber. It’s a bit of a trek, 20 odd miles, but well worth it. From their Alladin’s Cave of wood I bought some long lengths of 4×1 plank which they cut to required size for me on site (£14). These will form the horizontal sections of the frame, about 233cm or 7’6″ long. I ideally would have preferred old scaffold boards or 6×1 planks but the former were too pricy and they didnt have enough long pieces of the latter. Never mind, I will double up on 4x1s and so have 8in of depth to play with in the frame. 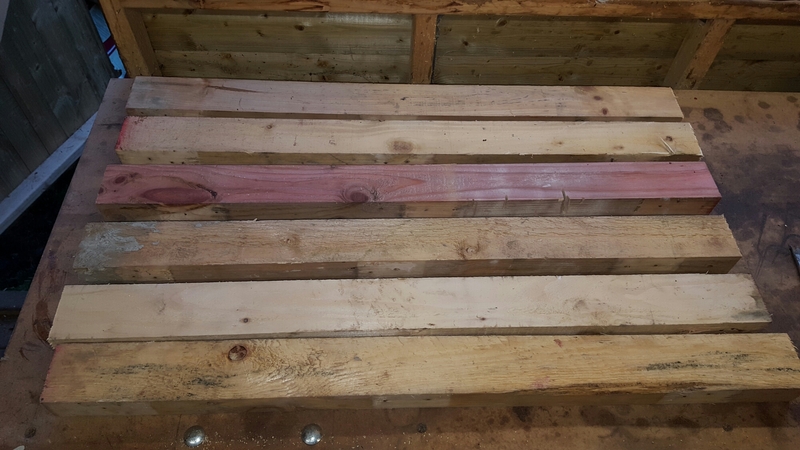 I already had pallet rails (£0) which are very solid, which I cut down to 90cm in length to form the legs for the bench. If I didn’t have these I’d have either foraged for more pallets or bought 3x2s from the wood palace. One of the unforseen downsides of maximising the size of the bench vs the greenhouse is that there isn’t much wiggle room to construct in there so I first built the sides in the shed. 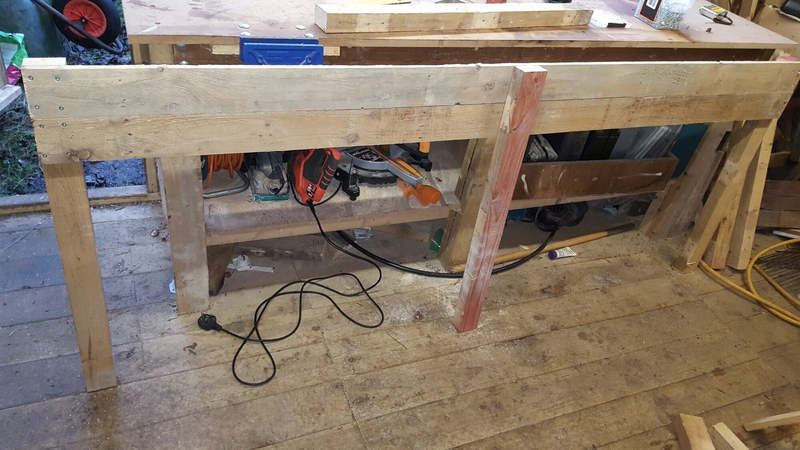 The 4×1 planks were screwed square to the legs with 2in screws, flush with the tops, two planks on each side. I added an extra leg on each side for the sake of robustness and so I can brace the base a bit more. It will eventually be holding a heavy load of sand, water and compost so it needs to be strong. I don’t want it all falling through the middle and wreaking propagation havoc. It would have looked neater to put the middle legs on the inside of the box frame but I wanted to have an uninterrupted run inside the frame to make it easier to spread out the liner when the time comes. I should’ve bought another couple of 4×1 planks for the bottom shelf but miscounted so will buy a couple in B&Q when I get the other bits I need. I moved the shorter side pieces into the greenhouse and after a bit of staging shuffling, screwed in the side pieces (93cm or 3′) which completed the basic frame for the bench. I ran out of daylight to finish it this weekend, to be continued!